Got mulch? You can use less water and improve the health of your trees and plants by using a layer of mulch, three to four inches deep, around your trees. Instead of having your “yard waste” hauled away, you can mulch by simply allowing fallen leaves and other plant matter to stay on the ground. To make your own: When you prune trees, you can chip the non-diseased branches into mulch using a chipper or your own pruning tools. Chippers will work on branches up to 3 inches in diameter. You can purchase or rent one from home improvement stores or equipment rental businesses. Do not use grass clippings as mulch around plants. They smother the soil and do not allow oxygen to get into the soil. Compost your grass clippings instead. Under existing trees and shrubs, allow the leaves and branches to fall and stay on the soil. Do not rake them up and throw them away, unless they are diseased. Remove weeds from around the base of the tree before mulching. If the soil surface is highly compacted, break up the surface using a metal rake or shovel before mulching. Place a 3- to 4-inch layer of mulch around the tree. 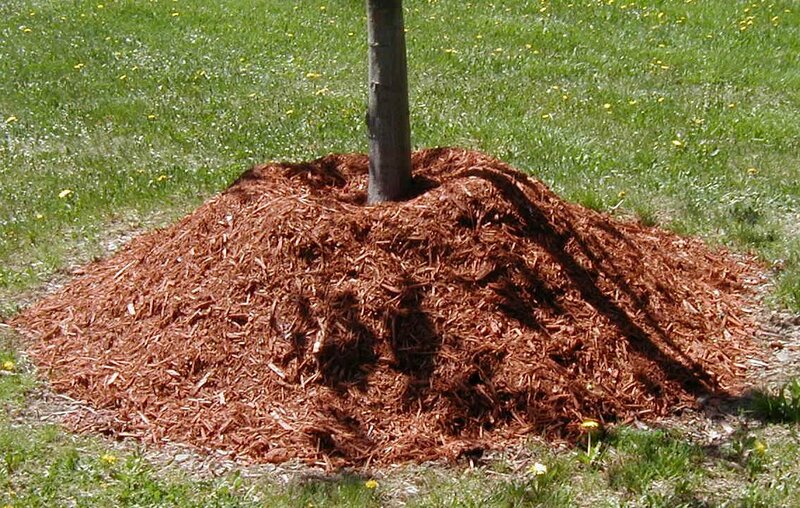 Keep the mulch at least 2 inches away from the base of the tree. If possible, mulch all the way out to the dripline (the dripline is the area that reaches out from the trunk and extends to the end of the branches). Be sure to mulch over the berm if you’ve created one around your tree.